I was looking forward to this assignment -- mountain biking Death Valley's Titus Canyon the first weekend in December. This 26-mile, one-way road begins off Nevada Highway 374 at an elevation of 3,400 feet, climbs west entering California at 5,250 feet, then descends through steep, narrow canyons and twisted rock layers to cross an alluvial fan and emerge onto the floor of Death Valley at an elevation of 200 feet. But El Nino apparently had other plans. The weekend storm that battered Southern California and other areas of the Southwest with up to 7 inches of rain still held enough moisture after crossing 4 mountains ranges to "drench" Death Valley and close Titus Canyon. On Thursday, after seeing CNN's Web weather forecast for Death Valley predicting showers for both Saturday and Sunday, I considered bailing on the whole trip. But I decided, whatever the conditions, it would be a fun group adventure with some friendly fellow travelers. And as it turned out, the extremes of winter weather -- rain, fog, drizzle, mist, mud and snow -- conspired to create one of the more dramatic and memorable weekend experiences I've had in any of the national parks. As we entered the southeastern corner Death Valley National Park on Highway 178 Saturday morning, the usually brilliant deserts vistas were obscured by skies bruised gray and bleeding a steady drizzle, punctuated by clear spots where wisps of low, white clouds shrouded the distant mountains. It had been raining here off and on since 5 AM. 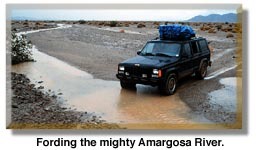 We started with a soggy back road trek to Saratoga Springs and forded the usually dry Amargosa River, which winds through the southern end of the park. 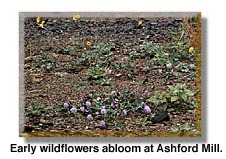 We were surprised to see a variety of wildflowers already in bloom, including Desert Holly (Perezia nana) Jones' Penstemon (Penstemon dolius), Sunray (Enceliopsis nudicaulis). From here, we retraced our steps and climbed to Jubilee Pass. As would occur throughout the weekend, we encountered heavier drizzle and fog with increased elevation. 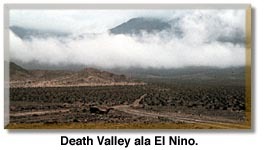 As we descended into Death Valley proper, the rain lightened, but everywhere fog and low-hanging clouds smeared the horizon and reduced visibility. Our caravan of a dozen 4x4s cruised north along the Death Valley salt pan, getting in and out of our vehicles at Ashford Mill, Badwater, Artists Palette and the Devils Golf Course, as the sky alternately darkened and drizzled and dried. Some among us were better prepared for inclement weather than others, so umbrellas, rain parkas and Gortex pants were shared all around. But by 4 PM when we arrived at Furnace Creek Visitor Center, most of our party were damp and cold and bleakly anticipated a night of camping in the rain. After cruising Texas Springs Campground and judging it too inhospitable weather-wise, we proceeded to the costlier (and cozier) Furnace Creek Campground where we found a wonderful site, well-cushioned and well-protected, within a grove of Tamarisk trees. We managed to pitch our tents and make camp before nightfall at 5:30, then all brewed various teas and coffees, cooked soups and stews as the drizzle continued. The long damp night ahead seemed foreboding. By 7 PM, we were exploring the area in the rain, and realized that our campsite was only 100 yards from the Visitor Center. There, we learned from the rangers that snow had closed a number of roads in and out of the park, except for chains and 4WD. 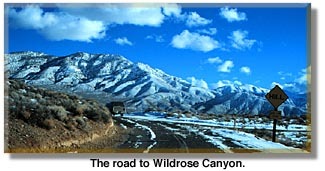 We also learned that Titus Canyon was closed and would remain so for the weekend. So much for mountain biking. Further explorations afoot led us back to the Furnace Creek Ranch area where private vendors operate a general store, restaurant, tavern and lodging facilities. We even discovered tennis courts and a golf course!. Toward the rear of "The Ranch," we happened upon the best kept secret in Death Valley National Park -- the free, mineral-spring swimming pool and its hot showers. Still chilled from our day's damp adventures, there was great reluctance to shuck our clothes and jump into a pool in the rain. But we finally talked ourselves into it, and discovered to our delight, that the pool was a steaming 90 degrees! After an hour of floating and swimming and splashing, watching the steam rise skyward, we took a blasting hot shower, dried off and dressed. By the time we returned to the campsite, everyone else was standing around damp and shivering. We were still steaming from our swim -- warm, comfortable and CLEAN -- ready for a great night's sleep. On Sunday, we awoke to more gray skies, low clouds and drizzle. A couple cups of coffee, some hot oatmeal, and we were ready for another day's muddy adventure. We left our tents set up and met our group at the Visitor Center before starting out for Harmony Borax Works, Scotty's Castle Ubehebe Crater and the ghost town of Rhyolite just inside Nevada. On the way back over Daylight Pass at 4,316 feet, we encountered our first snow. Our planned trips down Titus Canyon and out to the Racetrack Playa were both thwarted by the weather, and at day's end,we returned to camp for a gourmet Italian Dinner under the Tamarisks, just as the sky was clearing (see Desert Lil's Camping Recipes). After another great swim in the Furnace Creek Ranch pool, we turned in early so we could break camp in the morning, pack up and eat breakfast before meeting the group again at 8 AM. By the time we had finished breakfast and were taking down the tents, the morning dawned bright, clear and brilliant with no wind -- an incredible contrast to the previous two days. So we headed up to Zabriskie Point and Dantes View, where at 5,000 feet, we could finally appreciate the stark, grand desert vistas, made even more spectacular by the meteorological catharsis over the weekend. All about us the mountains were frosted white with snow -- the Panamints, the Black Mountains, the Furnace, and the Grapevine Mountains. 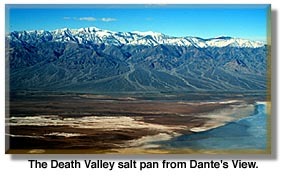 A mile below us, the Death Valley playa held more water in its three distinct basins than most of us had ever seen. We learned here that the mountain roads out of the park were now open, and two hours later we were on the opposite (western) side of Death Valley, driving through the Panamints up to Aguereberry Point (elevation of 6,433 above sea level). 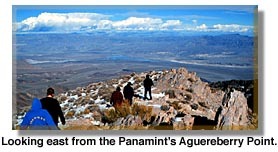 Here, our eyes watered with the dazzling views -- pierced by the surrounding snow-covered peaks and breathtaking views of Death Valley far below. 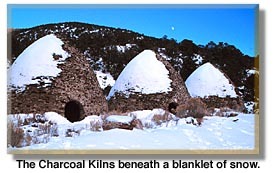 Continuing though Emigrant Pass (5,318 feet), we ascended to the Charcoal Kilns from Wildrose Canyon. Here, the snow deepened considerably as we approached 9,000 feet, and one by one, each 2-wheel drive vehicle spun out and fell by the wayside until only the 4x4s remained for the final leg to the kilns. We spent the next hour extracting various vehicles from the foot-deep snow on our way back down, then passed out of Death Valley National Park and into the town of Trona, just as the sun was setting behind the southern end of the Sierras.